Rozentāla laukums 1) from 13 April to 2 June 2019. 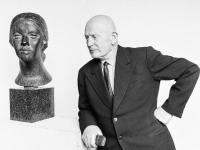 One of the key figures in Latvian professional art is sculptor and pedagogue Emīls Melderis (1889–1979). Reflecting on time passed and passing, in the year of the artist’s anniversary it is important to highlight the old master’s diverse creative legacy as well as to show long-unseen or never previously exhibited works in sculpture by Emīls Melderis from different periods of his career. The exhibition brings together a broad range of materials – works from the artist’s family and other collections, book illustrations, sketches for drawings, photographs of monuments and the artist’s personal belongings. smoothed surfaces, retaining a strict tectonics of masses as its basis. In parallel to his creative work, Emīls Melderis was a popular and loved pedagogue at the Art Academy of Latvia: “I have been able to wake up at five each morning and work in the studio in the early hours. Then I went to the academy, where I have spent my days, the biggest part of my life. Emīls Melderis was born on 27 May 1889 at Speļģi Homestead, Rencēni Parish, Valmiera District, died on 29 April 1979 in Riga and is buried in the 1st Forest Cemetery. Artist learned drawing from Teodors Ūders at Valmiera City School (1901–1907), Venjamin Blum’s school of painting and drawing in Riga (1908–1909), Baron von Stieglitz’s Central School of Technical Drawing in Saint Petersburg (1909–1915), as well as during his studies in Paris (1922–1923, 1928). Emīls Melderis worked as Head of the modelling class in Valmiera People’s High School (1919), as Head of the Sculpture Studio in Riga People’s High School (1930–1931, 1933–1934) and at the Art Academy of Latvia as Head of the Department of Drawing (1940–1941, 1944–1979) and Head of the Department of Sculpture (1945–1946, 1958–1971), professor (since 1947). Emīls Melderis was a member of the Riga Artists’ Group (1930–1938) and member of the Artists’ Union of Latvia since 1944. He took part in exhibitions since 1919. Worked in free-standing sculpture and monumental sculpture, made medals and drew book illustrations. The artist’s works are held in the collections of the Latvian National Museum of Art, Museum of the Artists’ Union of Latvia, Tukums Museum as well as privately.